In Australian waterways in the 12 months to 30 June 2017, 291 lives were lost to drowning. The drowning statistics for 2016 to 2017 tell the story in each of the age groups. 0-4 years: 29 drowning deaths. Most of these drownings occurred after toddlers fell or wandered into water, often in swimming pools where access was not restricted. 5-14 year olds: 12 drowning deaths. Water safety and lifesaving education is vital for all school children. 15-17 year olds: 2 drowning deaths. 18-24 year olds: the traditional risk-taking and alcohol consuming group — 29 drowning deaths. 25-34 year olds: 43 drownings. 35-54 year olds: 75 drownings. 55-64 year olds: 31 drowning deaths. 65+ years: 70 drownings. Older people should be aware of their current fitness levels and any pre-existing medical conditions that could affect their abilities in the water. exercising extreme caution when swimming in rivers, lakes and dams. Rivers, creeks, lakes, dams, streams and waterholes can be very dangerous and are often close to populated areas or popular tourist spots. More drowning deaths occurred in these locations than anywhere else in 2016-2017.
submerged objects such as tree roots. Before entering the water, check for presence and strength of a current. Currents can be strong even when the surface of the water appears still. Explore the water for depth and presence of any hazards such as rocks, weeds, logs and holes. To avoid the risk of spinal injuries, always get into water feet first and never dive in. Swimming in cold water is also dangerous as it can cause hypothermia. The temperature of water can be much lower than you imagine, and you can succumb to hypothermia quickly. If you feel cold, get out straight away. Usually, you are not as buoyant in inland water as you are in coastal water, which can also be a factor in drownings. Many drowning deaths occur at the beach. Here are some beach safety hints. Always swim with another person. Be aware of your own abilities and limitations of your skills and fitness. Never run or dive in the water, even if you have checked the depth before. Water conditions can change. If you get into trouble in the water, stay calm. Raise your arm to signal for help, float and wait for assistance. Learn how to spot a rip and keep clear of it. A rip can be recognised by sand-coloured or rippled water running out to sea when the water on either side is generally cleaner. The waves may also be larger and breaking further out to sea on both sides of the rip. parents and children undertake water familiarisation classes. Although the home may seem to be a relatively safe place, it has many potential dangers, particularly for very young children. Always supervise children when they are in, on or near the water. It is very easy for those supervising young children to be momentarily distracted, but it takes only a moment for a child to drown. Active supervision of children requires your full attention – you need to be constantly watching and always be within arm's reach. Most public and some private pools will have notices around or near the pool with rules of use — read and obey these rules as well as the pool lifeguards or owners. Check pool depths before diving and make sure water is clear before jumping in. Among preventable accidents, those caused by people diving into water can be among the most tragic. 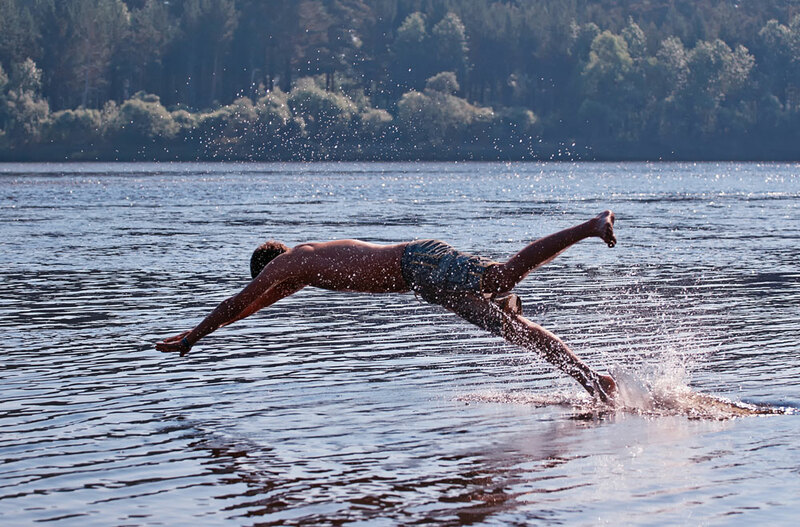 Diving into shallow water can result in the head hitting the bottom, which can damage the spine and spinal cord. This can cause immediate death, tetraplegia (also known as quadriplegia - loss of sensation and movement in the upper and lower body) or paraplegia (loss of sensation and movement from the waist down). Almost 10 per cent of all accidental spinal cord injuries in Australia are caused by diving or jumping into water and surfing. The spinal cord injuries caused by diving are generally very severe, with damage to the neck resulting in tetraplegia. Sadly, these injuries are most common among young people. Alcohol is a factor in many of these accidents. Following some simple, common sense rules can prevent most of these accidents, which could mean that you avoid spending the rest of your life in a wheelchair. Always check the depth of the water and for any obstacles before diving. If in doubt about the water depth, enter slowly, feet first. Never dive into murky water. In inland waters remember there may be submerged obstacles that are invisible from above the surface, such as branches and rocks. Never run and dive into water - there may be sandbanks or submerged rocks. Remember that surfing, water-skiing and windsurfing in shallow water can break your neck. Water activities are a great source of pleasure to most of us. Don't let them ruin your life. 1. Royal Life Saving Society Australia. Royal Life Saving National Drowning Report 2017. https://www.royallifesaving.com.au/__data/assets/pdf_file/0010/20260/RLS_NDR2017_ReportLR.pdf (accessed Dec 2017). 2. Royal Life Saving Society Australia. Fact sheet No. 07 Home water safety. http://www.royallifesaving.com.au/__data/assets/pdf_file/0003/3963/7.-Home-Water-Safety.pdf (accessed Dec 2017). 3. Royal Life Saving Society Australia. Fact sheet No. 13 Inland waterways. http://www.royallifesaving.com.au/__data/assets/pdf_file/0009/3969/13.-Inland-Waterways.pdf (accessed Dec 2017). 4. Royal Life Saving Society Australia. Fact sheet No. 27 Beach safety. http://www.royallifesaving.com.au/__data/assets/pdf_file/0013/4009/27.-Beach-Safety.pdf (accessed Dec 2017).